made from copper disc that I hand cut out the negative area around the tree and then textured the brass disc for the back. After the piece was sanded it was then riveted together with a small piece of tube in between to give it a little space between the top and bottom disc. nice rivets!!! its a very gorgeous piece! I like how you used spacers. It adds a lot more dimension. Thank you. Yes, it really needs the space to made the tree stand out. I really like the contrast of colors in this design, creating the feeling of the sun shining around a tree at sunrise or sunset. The texturing of the brass is a nice touch. Thank you so much! Yes, I was going for the feeling of the sun shining around it! You give me a lot of inspiration. I love it when you do these multi-dimensional pieces. Thank you so much! I really like them too. I do too... I think it really makes the tree stand out more. Love it! The studs around the circle look good. ooooh, my mom would love this!! Beautiful! The contrast of colors and textures makes this warm and tangible. 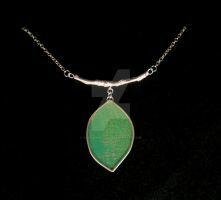 Not just a piece to be worn, per se, but a pendant to be cherish. Wonderful job! i love the 3-D effect and the shine of the brass behind the copper! Thanks. I kinda wanted it to look like the sun was shinning behind the tree. I like the space created, it gives the pendant a nice effect! Did you ever consider adding wood or felt or other natural materials to pendants like this one? I think it could look really good. That is a really good idea. So far I haven't tried to incorporate other materials in my pieces but I should give it a try. Thanks!